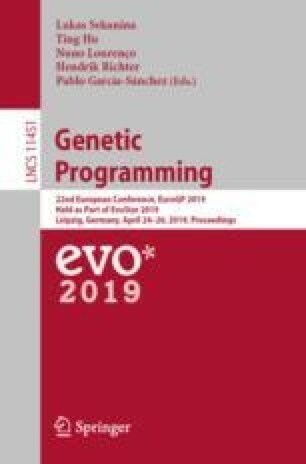 Among the various typologies of problems to which Genetic Programming (GP) has been applied since its origins, symbolic regression is one of the most popular. A common situation consists in the prediction of a target time series based on scalar features and other time series variables collected from multiple subjects. To manage this problem with GP data needs a panel representation where each observation corresponds to a collection on a subject at a precise time instant. However, representing data in this form may imply a loss of information: for instance, the algorithm may not be able to recognize observations belonging to the same subject and their recording order. To maintain the source of knowledge supplied by ordered sequences as time series, we propose a new approach to GP that keeps instances of the same observation together in a vector, introducing vectorial variables as terminals. This new representation allows aggregate functions in the primitive GP set, included with the purpose of describing the behaviour of vectorial variables. In this work, we perform a comparative analysis of vectorial GP (VE-GP) against standard GP (ST-GP). Experiments are conducted on different benchmark problems to highlight the advantages of this new approach. This work was partially supported by FCT through funding of LASIGE Research Unit (UID/CEC/00408/2019), BioISI Research Unit (UID/MULTI/04046/2013), and projects INTERPHENO (PTDC/ASP-PLA/28-726/2017), PERSEIDS (PTDC/EMS-SIS/0642/2014), OPTOX (PTDC/CTA-AMB/30056/2017), BINDER (PTDC/CCI-INF/29168/2017), GADgET (DS-AIPA/DS/0022/2018) and PREDICT (PTDC/CCI-CIF/29877/2017).